It was with a slight hesitation that the sales manager added the second sentence about sales lead management being a marketing function. Of course it is, but only partially. With marketing automation it is a growing part of the job. Lead nurturing and initial qualification calls to prospects may lie with marketing automation or inside sales qualification specialists (unless it is outsourced). But the actual, final management of the prospect is square in the lap of the individual salesperson. The responsibility for addressing prospects’ needs remains a major part of the sales job. It isn’t a secret that 45-55% of all sales leads turn into a sale for someone within a typical 12-month period. The question is whether the sales manager and his or her salespeople know it. If the follow-up is only 10% (an often repeated percentage) the salesperson on average will only speak to 5% of the buyers. If the salesperson follows up with 25% of the inquirers, he or she will only speak with 11-12% of the buyers. So it makes sense that to speak to 100% of the buyers, the rep will have to call them all. In every 100 inquiries, he or she must talk to 55 non-buyers in order to reach the 45 who will buy. 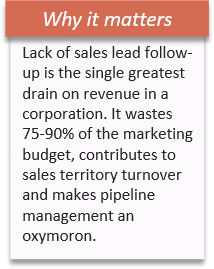 Lack of sales lead follow-up is the single greatest drain on revenue in a corporation. It wastes 75-90% of the marketing budget, contributes to sales territory turnover, and makes pipeline management an oxymoron. If the rep doesn’t call all of the prospects, there is no control over the outcome because those not spoken to will buy from salespeople who do contact. I wish it were more complicated, but it isn’t. Sales reps sort inquiries into those with buying potential and those without potential; this is often done without talking to the prospect. They inquired before and didn’t buy. They didn’t leave a phone number. It isn’t an inquiry on a product I have a quota for. They are too far out of my territory. I don’t think they are big enough. This is a home address and phone number. I couldn’t find time to follow up, and it’s been four weeks so I think they have already bought. One of the reasons marketing automation programs have been so successful is that these programs contact 100% of the inquirers. I didn’t say the program talks to them, but it does communicate. Some people make the case that artificial intelligence/ machine learning programs, such as Conversica, ActiveConversion, dbSignals, etc., are the answer. These software programs “talk” to the prospect without human intervention because of the program’s ability to make decisions and deliver answers based on the questions, the person, the institution, previous inquiries, internet activity, etc. These programs also provide intelligence based on millions of sales leads and billions of sales interactions to help the sales rep know early on if the person is a likely buyer. The growing popularity of outsourcing sales lead follow-up shifts the responsibility to an outside service person who must perform the follow-up, and in many cases, present a sales-ready lead to salespeople. Someone can say that follow-up is the salesperson’s job and they should do it. It appears, however, that follow-up is thought of as an optional sales chore by 75-90% of salespeople. They have many things to do, they say, while the outsourced service has essentially one thing to do: contact the prospect, judge qualification, and eventually present a sales-ready lead to salespeople who should have done it in the first place. 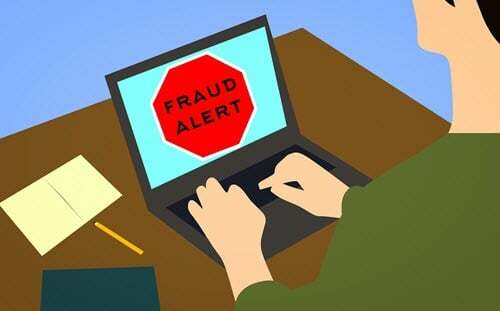 Today's blog was submitted by James Obermayer, Executive Director and CEO of the Sales Lead Management Association and President of Sales Leakage Consulting. SLMA Membership is free and so are its 22 career benefits. James is a regular guest blogger with ViewPoint.